Swept by a light morning wind, the Bosporus overwhelms my drowsiness just like a finger snap. The bus runs silently over a single-arched titanic viaduct, metal connection between Asia and Europe, while the sun on the horizon makes an effort to complete its oval, signaling a brand new day. Istanbul. Constantinople. Byzantium. The most polyglot city in the world reveals itself up until its toponymy. Founded in the 7th Century BC, it was named after King Byzas by his colonists from Megara. In 330, Emperor Constantine renamed it Costantinou Polis, his “Nova Roma”. Twelve centuries later, the Sublime Porte put its present seal on history: Istanbul, from the Greek “istinpolis ”. Simply, “downtown”. My only objective here is to gather information and leave. Mussa passed on this bridge only a few hours ago, headed North, headed towards the Evros River, the last door of Europe. If he gets in contact as soon as he enters Greece, as he has promised, I could even meet him tomorrow. Finally. The body, though, does not always adapt to the pace of the mind. Suddenly, deep stabbing pains shake me: even though it is 40 degrees in the city, I am freezing cold. With the fever, what disappears along with my energy is the hope of beating Mussa Khan’s trail, still hot. My trip will stop in Istanbul, at least for now. “Your friend must already be in the hands of the Greek police. Very tough moments await him in the detention camps across the Evros”. Thursday. I had to force myself to rest for four days, to get back on my feet. In the central office of the Helsinki Citizenship Assembly in Istanbul, I meet again with Maria, the lawyer I had met in Van two weeks earlier. I learn she was in Kurdistan on a mission, but that she normally works in these premises. The atmosphere is friendly, as if we were old friends. “After crossing the river, migrants usually turn themselves in to the police forces. Happy to finally be in Europe, they expect to be treated well. The same traffickers encourage them to turn to the police”. While talking, Maria takes a rich and detailed report off a shelf. “Actually, living conditions in the detention camps are awful. Migrants are amassed in big filthy rooms, after a perfunctory registration. There are no interpreters, procedures are vague and agents too often recur to tough action. But this”, Maria ensures leafing through the report, “is the least of problems. The worst comes later”. I think I already know what evil she wants to talk to me about: extra-legal expulsions. Page 26 of Europe's murderous borders, the report published by the organization Migreurop. Maria reads with a flat voice: “During the 2005-2007 period, while there were 54.608 expulsion decisions issued by the Greek Government, 141.777 migrants were deported. This means that nearly two thirds of the migrants expelled from Greece were sent back without them having received an expulsion order”. Expulsions are carried out in the muddy waters of the Evros. “We have recently seen a decrease in the phenomenon”, Maria states, “but we are still very worried. It is difficult to obtain any information from those places. It is one of the hottest borders of Europe, and the strong military presence on both banks of the river does not allow us to keep garrisons in the region”. Performed in total and open breach of international law, extra-legal expulsions carried out by Athens have devastating effects if you think that Turkey, in turn, systematically repatriates Iraqi, Iranian and Afghan citizens. “Chain expulsions” pose the biggest danger for migrants, that of being handed over to authorities in their home countries. And that is what they are trying to escape from, even by risking their lives. “Turkey and Greece are negotiating a new re-admissions agreement”, Maria continues. “It seems Ankara is willing to accept a much higher percentage of migrants compared to the present one. This way Greece will no longer have to turn to illegal expulsions. The outcome, though, will remain the same: upon entering the European Union, instead of being welcomed and granted asylum, migrants will be repatriated”. In turn, according to rumors gathered by Maria, Turkey hopes to obtain a facilitated visa regime for its citizens headed to Europe. These rumors are confirmed in the afternoon by Ahmad, a lawyer at IHD and an expert in human rights. “The European Union believes re-admissions agreements signed by its member states with Ankara are fully lawful. Unfortunately, it ignores the fact that Turkey is still very much lagging behind with regards to human rights protection. For our Government, migrants are just a negotiating card on the table in Brussels”. Along with repatriations, in its many years of activity, the IHD has reported countless episodes of torture, ill-treatment and, in some cases, homicide within the Turkish jails. The young and whirling vitality of Istanbul’s center confounds me. Out of the office, I walk along Istiklal Caddesi, Independence Avenue, the huge window where the West shows the side of itself that it loves the most: the one with the shop windows, endless colorful lights, fast foods. Still recovering from the fever, I sit on a step, observing the endless mass of people parading in front of me. Three million people are said to walk this avenue every day. I try to understand what point I have gotten to. In the past few days, Mussa Khan has never turned his cell phone on, confirming Maria’s thoughts: he must be in a detention camp. Under those circumstances, you are deprived of all personal belongings, even shoe laces. He will only be able to communicate once he is out of there. There are very slight chances of meeting other muhajirins: migrants stop in Istanbul just enough time to find means to transport them closer to the dream called Europe. After buying fake identity documents, some of them try taking an airplane; others try to board on ships headed to Greece; others buy bus tickets to Sofia or Athens. The majority, though, pour out into the muddy waters of the Evros. I will follow this last route. I now belong to a flow that is larger than me, that drives me during my moments of indecision. Before leaving the city, though, I must visit the one place that fills the memories and nightmares of the many muhajirins I have met along my path: Kumkapi, Istanbul’s detention center. “The food was never enough, so the guards had set up a black market inside the prison. Prices for a sandwich were three times higher than normal”. Osama, an Afghan, had lived in Kumkapi for about two months. Once he was released, he sought asylum in Van, where I met him. When he spoke to me about Kumkapi, during one of the long nights on the plateau, I had imagined a remote place, in the suburbs, far from the city and the minds. In a low voice, Osama told me about episodes of violence, abuse, bullying. “Inside there, they are almost all Afghan muhajirins. Entire families, no separate rooms. The police does not spare violence, not even on the weakest, women and children included”. Kumkapi, a tangle of letters. When I finally find it, I am appalled. The building, an old court used as a prison, is surrounded on three sides by restaurants. 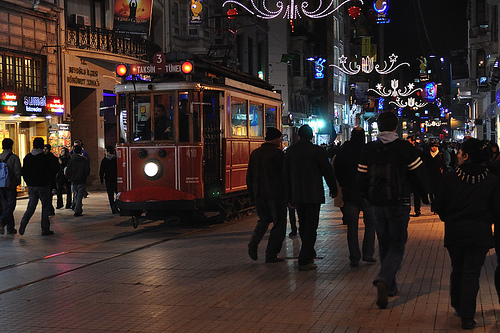 It is one of the most touristy areas of Istanbul. In disbelief, I sit at one of the tables on the sidewalk. Tired hands cling from the bars on the windows, while only the glimmer reflected by the eyes of the prisoners comes out from the half-darkness of the cells. I take a walk around the building, counting approximately 30 cells per side. The white paint of the façades is interrupted every once in a while by colorful clothes hanging like the wash from the windowsills. I sit back at the restaurant. I want to immortalize this absurd normalcy on a picture: from a cell, a young man crosses glances with me, while at the tables around me people are being served mugs of cold beer. I put my camera back. I go close to the barriers to greet him, just a Salam ualeikum before leaving: rapacious, an officer in plain clothes rushes to grasp my arm and move me away decidedly, but in silence. He cannot disturb the movida of an evening that has just started. There is nothing more for me to do, here. I greet him with my hands, he greets back, and I move away. I am back to my journey, to the troubled search for Mussa Khan’s trail which, ironically, gets more and more faded the closer I get to his destination.